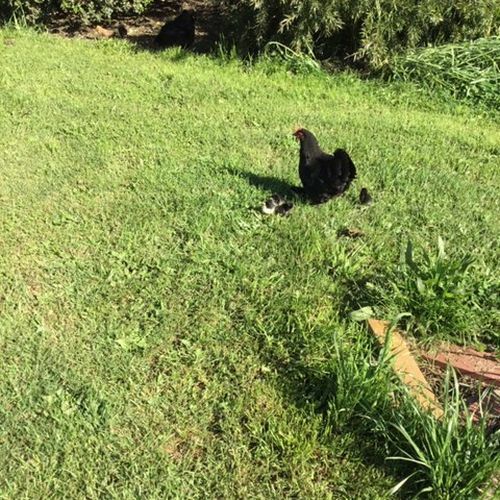 Following a quoll attack last year, (or that of a feral cat; the jury is still out on that one), we were down to just three bantam chooks, one of whom is ‘Granny’ and well into the equivalent of chook menopause. Or so we thought. We saved a young bantam rooster from certain death a few weeks ago, thanks to a neighbour’s generosity, and acquired another bantam shortly afterwards after other neighbours left her behind when they vacated their rental property. Granny surprised us by producing eggs again, and when it became clear she was preparing to sit, we asked Rooster Boy’s former owner if we could buy some fertile eggs to put under her so we had a chance to increase our little flock, and its genetic diversity. Although five hatched – almost six but one died trying to break out of the egg – the hazards of free-range living were soon apparent. Granny did her best, and she is a good and vigilant mother, but she lost two chicks almost immediately, probably to a hawk or a raven. She still has three though, which are now growing apace, and which she’s keeping close, so fingers crossed they will all survive. In the meantime one of Granny’s flighty offspring has also hatched five chickens, but is proving to be a negligent mother. She barely batted an eyelid, much less raised the alarm or put up a fight when a raven swooped twice in one day and picked off two chicks, no doubt to feed its own hungry family. We know from past experience that once these predator birds know where to find breakfast they will return to pick the chicks off one by one, so we aren’t anticipating this little family will grow up to adulthood. As for the orphaned bantam, well she’s still an unknown quantity. She’s been sharing a nest with Sandy Chook, the third of the survivors, but appears to have won the battle for sitting rights. In a few days she will emerge with brood number three, and time for her parenting skills to be put to the test. Fingers crossed she will prove to be a feisty mother willing and able to look after her chicks. Time will tell.